Our dog bandanas do not have any buckles or fasteners. They are easy to fit and adjustable. Simply tie the bandana around your dog's neck to fit. If you find that the size you have ordered is a little too large, the top edge of the bandana can be folded before tying to get a better fit. This dog bandana features white stars on a grey background and can be personalised with your pets name! Select from the drop down menu which font and colour of text you would like. Please enter your pets name in the box provided above. Please double check the spelling as names will be printed exactly as entered and we will not be responsible for any spelling mistakes. Personalised bandanas are not available for a refund or exchange unless you receive the wrong item. 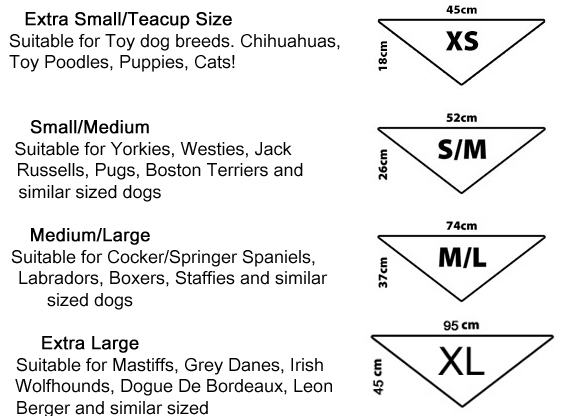 Each personalised dog bandana is handmade to order so please allow 4-7 working days for delivery. If you have any other problem with your order please get in contact with us and we will be happy to help. For international shipping please email us at support@chelseadogs.com prior to making your purchase so we can confirm the delivery address and additional cost.